Peter Sagan has moved into the overall lead of the Tour of California with victory in the stage six time trial. The Slovakian, who has finished in the top three in each of the previous five stages, was 15 seconds ahead of Jos van Emden of the Netherlands. 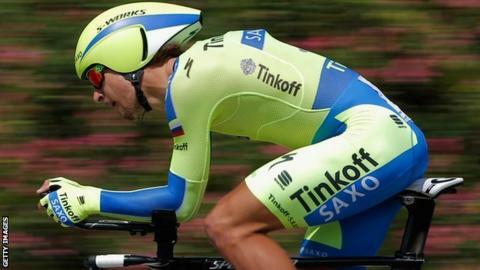 Tinkoff-Saxo rider Sagan, 28, now leads Latvia's Toms Skujins by 28 seconds in the overall standings. Britain's Mark Cavendish continues to lead the points competition and is six clear of Sagan with two stages left. The Etixx - Quick-Step rider finished 45 seconds behind Sagan in the 10.6km time trial that was moved from Big Bear Lake to Six Flags Magic Mountain in Santa Clarita because of snow. Tao Geoghegan Hart is the leading Briton in the general classification, trailing Sagan by one minute and five seconds. The eight-stage race continues on Saturday with a summit finish on Mount Baldy, before Sunday's sprint-friendly finale in Pasadena. AMGEN Tour of California -- AMGEN Tour of California Bike Race - Welcome Cycling Fans! Read more on AMGEN Tour of California -- AMGEN Tour of California Bike Race - Welcome Cycling Fans!